Discounts will vary based on ticket type and date—not all tickets will have such great savings (hence “up to”). In particular, the best discounts will be on tickets under the spring special pricing—valid for dates now – April 13, 2019 and April 23 – May 23, 2019. If you just want to start browsing ticket prices, click through here and be sure to use Promo Code MHTIX in your cart for the final $1 off. 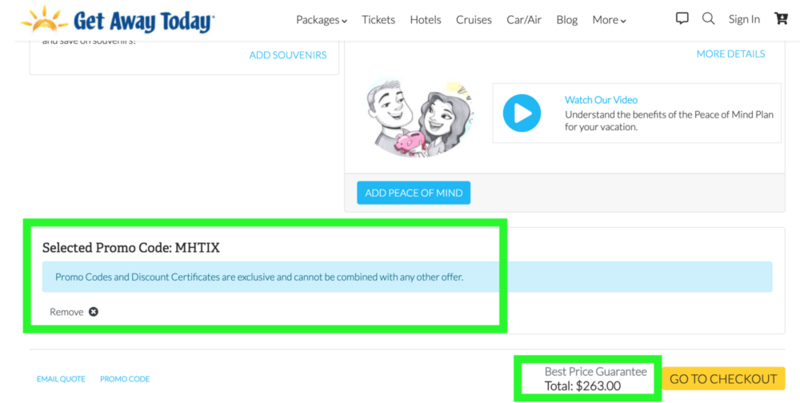 Otherwise, read on to see an example of how this offer can save you $132 per ticket! As an example, we’ve picked travel starting May 13, 2019. 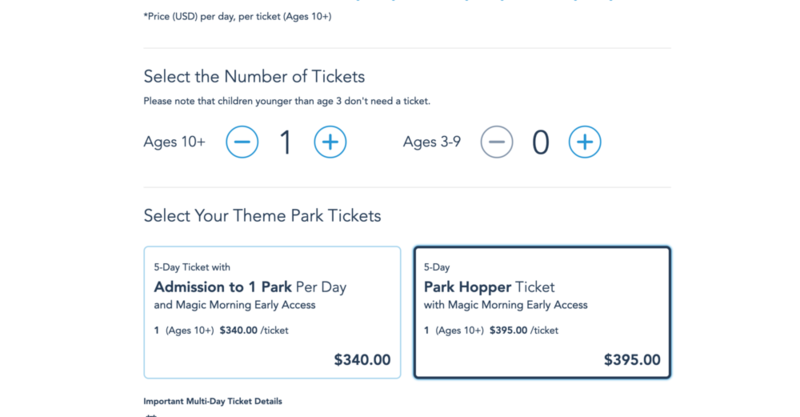 If we purchase tickets via the Disneyland website, we’d pay $395 for a five-day park hopper ticket. 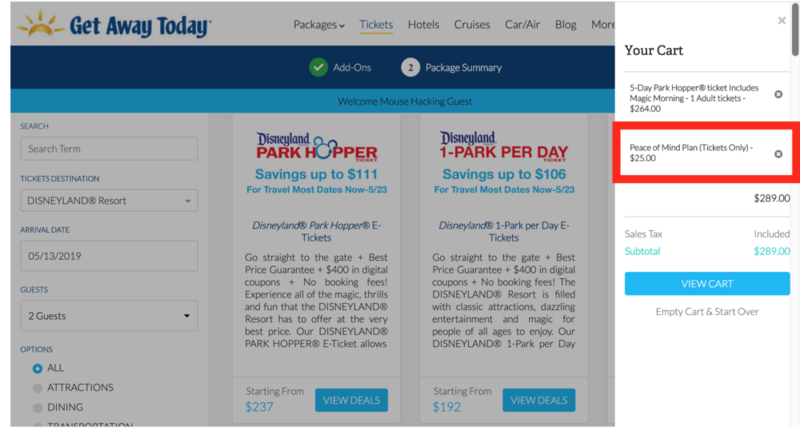 If we purchased from Get Away Today without using the Mouse Hacking link or discount code, we’d pay $284—savings of $111 per ticket. BUT WAIT, there’s more! But, if we make the same purchase by clicking through the Mouse Hacking affiliate link, the price drops an additional $20 to $264—savings of $131. The final $1 discount is added in your cart. Click the cart icon on the top right. You can decide whether you want to keep the “Peace of Mind” protection plan (when you click the little x you’ll see an explanation of this). 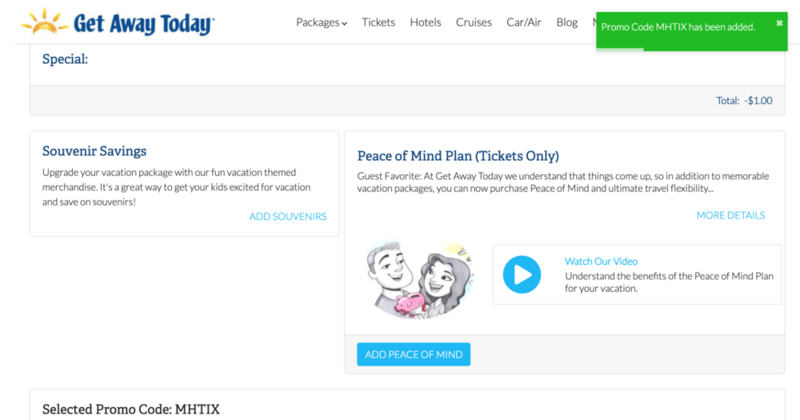 Finally, if we add on promo code MHTIX, we get the price down to $263, for savings of $132. Scroll down to the bottom of your cart, click the Promo Code option, enter MHTIX, and hit submit! Never just accept the first offer that comes around, even if it’s ours! 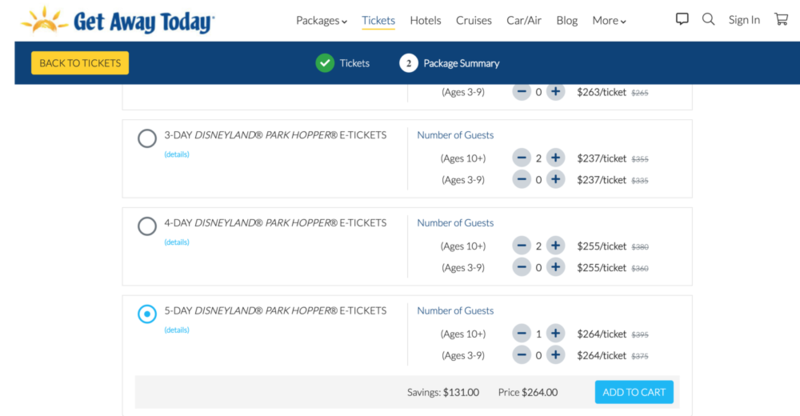 Our discount Disneyland tickets guide has other places you’ll want to check before you buy your Disneyland tickets!